Merge onto NY-13 S / NY-34 S / NY-96 S. Continue to follow NY-13 S. Turn LEFT onto CAYUTA RD / CR-135 / CR-12. Continue to follow CAYUTA RD. Turn LEFT onto NY-224. Turn RIGHT onto GEE ST / NY-34. Continue to follow NY-34. Turn SLIGHT LEFT. Turn SLIGHT RIGHT onto NY-17C / CHEMUNG ST. End at 158 Chemung Street. Start out going NORTH on US-220 Continue to follow US-220 N. Turn RIGHT onto NY-17C / CHEMUNG ST. End at 158 Chemung Street. Merge on to RT-17 E / I-86 E. Take the RT-34 / PA-199 exit- EXIT 61- toward WAVERLY / SAYRE. Turn LEFT onto NY-34 / NY-199. Continue to follow NY-34. Turn LEFT onto NY-17C / CHEMUNG ST. End at 158 Chemung Street. 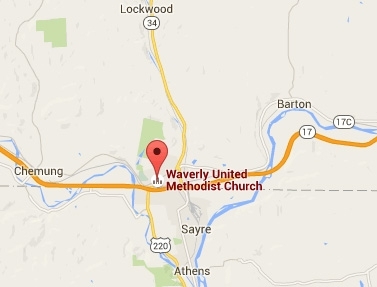 Merge on to RT-17 E / I-86 E. Take the US-220 exit- EXIT 60- toward WAVERLY / SAYRE. Turn LEFT onto US-220 N. Turn RIGHT onto NY-17C / CHEMUNG ST. End at 158 Chemung Street.